In a medium bowl, whisk together reduced citrus juice, reserved orange zest, vinegar, honey, soy sauce and mustard. Add the oil in a slow stream while whisking constantly. Season to taste with salt and pepper. Reserve half (about ⅓ c) of the vinaigrette for dressing the salad. Pour remaining half of vinaigrette into a 1-gallon plastic bag. Add tuna and refrigerate for 30 minutes-1 hour, no longer. Heat a large nonstick skillet over medium high heat. Remove the tuna and discard marinade. Add tuna, searing on one side, about 1-2 minutes. Turn and sear the other side, about 1-2 minutes more, for rare to medium-rare tuna. Transfer to a carving board. In a large bowl, gently toss the greens with the reserved vinaigrette. Add the citrus supremes, avocado and shallot and toss again. Season to taste with salt and pepper. Divide among four dinner plates. Slice each tuna steak across the grain into ½-inch slices. 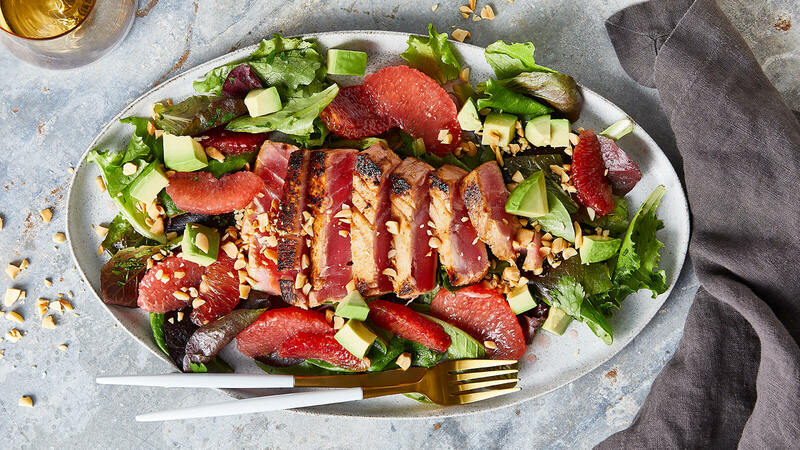 Top each salad with a tuna steak, fanning out the slices. Sprinkle with the peanuts and serve. **Reducing the citrus juice intensifies the flavor. It is an extra step, but it makes all the difference.